Today we read the first words from the Sermon on the Mount. This is one on the most well know texts of the Bible. This is an incredibly important text. Of course, you may think, this is what pastors always say. That’s true. All texts in the Bible are important. For this is true God speaking to us. God conversing with us. But this time it is worth to repeat it, – this is, indeed, very, very important text. Why? The Gospel according Matthew is the first among the four gospels. These words which we heard today are from the first public speech of Jesus recorded by Matthew. Besides these words which we heard today set the tone for the entire Sermon on the Mount, and not only for it, but also for the entire Gospel message. Today we will focus on the very first beatitude. “Blessed are the poor in spirit, for theirs is the kingdom of heaven.” You can even say that this beatitude is the Gospel in nutshell. For these words really are the key to understand what being a Christian is all about. Today we will meditate on these few words and we’ll try to understand what does it mean to be a Christian? What does it mean to be a Christian? But first let’s talk about spirituality in our culture. It is quite a popular theme. Remember, the last time we talked a little bit about how our culture encourages everyone to focus on themselves. It is about ‘you’. Live for yourself. Think about yourself. Care, first, about yourself. This same mindset has also changed what our society thinks about spirituality. We can hear negative and pejorative remarks about Christianity, but at the same time people are quite favorably disposed towards spirituality. It is important to understand what is meant by this spirituality, for today we read that ‘blessed are the poor in spirit’, or we could rephrase it as ‘blessed are spiritually poor’. Even in our Western culture, despite of ongoing promotion of evolutionary worldview, people realize that there is more than just material world. Our consciousness, and our inner mental processes, especially our conscience can’t be explained assuming that matter is all that exists. So what to do? How to put together desire to be gods ourselves, to do whatever I chose to do, and this experience that we are more than just matter. Can your guess? It is not difficult. The answer is what popular culture today calls ‘spirituality’. Being spiritual people. What exactly is meant by it may differ every time, but there are common elements. What are they? First. My spirituality is about – whom? – yes! Me! About discovering, or enriching, or improving my true self, looking for the divine in me. For God in me. Let me put it straight, – for me, who is a god. “You will be like gods…” – remember who said it? Other common element. Who decides what is spiritually good? Can you guess? Who is the highest authority in questions of spirituality? But, of course, mighty me! Who else?! I decide what I like and what I don’t, and no one is going to tell me otherwise. This kind of spirituality is nothing else than shameless rebellion against true God. This is why you can hear people saying that they don’t like and don’t need organized religion, by that meaning Biblical Christianity. Why do they say that? Because in the Church you are not a god anymore. It’s not up for individuals to decide what is right and what is wrong. It is pre-determined by someone else. This someone else also happens to claim that He is the true God. The Father and the Son and the Holy Spirit. There couldn’t be two gods, ‘mighty me’ and someone else, right? One has to go. What do victims of Western individualism say? “Let this other go, I will stay and do my own spiritual thing.” I’ll be a god myself. This is contemporary spirituality. Spirituality of divine ‘me’ and about divine me. When you hear people saying that they are spiritual, but not religious, what they actually are saying is – that they are gods, and not someone else. Rebels. Unfortunately so many among those who formally belong to the Church of Christ have accepted this mentality. They dream that Christianity is one of possible sources where ‘I’ can nourish ‘my’ spirituality, if I chose to. It is not about the truth anymore, it is not about forgiveness and salvation, it is not about God coming to save us, but about my spiritual satisfaction. About me being spiritually enriched. Jesus is saying that blessed are spiritually poor, and not the spiritually advanced people. What is He up to with this enigmatic saying? How can those who are in spiritual poverty be called blessed? What does it mean to be poor in spirit? It doesn’t mean material poverty. It doesn’t mean a lack of the Holy Spirit, or a lack of spiritual awareness. The gospel according Matthew and also the Old Testament explains exactly what is meant by these words. “The poor in spirit’ are people who realize their unworthiness before the Holy One. Being poor in spirit is a very opposite to arrogant self-confidence which is often expressed as ‘I’m such a spiritual person, I don’t need this God of the Bible’, or ‘I myself are in control of my life and everything I have achieved myself’. The poor in spirit are those who realize that they have nothing that belongs to them. There is nothing they haven’t received and therefore there is nothing to boast about. They are poor in a sense that they realize and admit that everything they have and are, belongs to the Lord. They are just beggars. This is true spirituality according Jesus. This is what it means to be a Christian. Other one. The apostle Paul writing to Romans: “I know that nothing good dwells in me… For I do not do the good I want, but the evil I do not want is what I keep on doing.” (Rom 7:18-19) Just think who said it! The apostle Paul. He Himself planted congregations across the Roman empire, and this is what he says about himself. These examples illustrate what is meant by ‘spiritually poor’. It means admitting that God is God and I’m not. That He is the Creator and I am creature. That He is holy and I’m sinner. That everything I have and everything I am – all of the above are His gracious gifts. All is given. It doesn’t matter how much we have, we are the poor and the beggars before God. This is what Christian spirituality is about, this is what it means to be a Christian. It is not about our achievements. It is about being spiritual beggars, it is about us receiving everything from bounteous and loving God. I can imagine that it sounds a little… uncomfortable. Not just surrounding culture, but also old Adam within us protests against it. We would feel much better being spiritually rich, ‘spiritual people’ and being able to show God what we have done, than being spiritually poor with nothing to show. But just think for a while about what Jesus is saying. There are just two options. One, you imagine that you are a god yourself, that you are in control of your life and you yourself have built it, it belongs to you, and it is the source of your security. You need to protect what you have, fight for it, you can’t let it go. Your entire existence and future hinges on it. Again, it may sound uncomfortable for us, for Jesus demands us to become the poor, the beggars. Today we hear so much about high self-esteem, as if this is the most important thing. Self-esteem. Being a beggar doesn’t fit well in this picture of high self-esteem. But again, just think for a while. If we claim that we are something when it’s not true, we just keep deceiving ourselves. Instead, listen what God the Father is saying to you and about you, – you, you [!] are created in His image and likeness. You are His representative, His ambassador for all the people in your life. Yes, we are born as sinners, but the Son of God Himself gave up His life to rescue you, to purify you from all your sins, and all the sins that have been done against you. What does this tell about how precious you are in God’s eyes? Whatever high is your self-esteem, it doesn’t add to your value. When God the Creator of Universe look at you and says: “You are my beloved child, you are my heir, to you I give my Kingdom…” That changes everything. You can’t merit it. You can’t achieve it with your spirituality or other accomplishments. You can only receive it as a gift. But to receive the gift, you need to admit that you are ‘the poor’ and extent your hand. As soon as you do it, the Kingdom of God is yours. Yours. The Father keeps giving you His spirit, you already are a member of His royal family. You are already a child of God. Nothing can change it. All that belong to the Father, belongs to the Son, and we are co-heirs with Him. We are just waiting for His return, for the renewed heaven and renewed Earth as our home. But even today, just think about it, as soon as you are a member of His family, you have countless brothers as sisters. Look around, these are the people with who you’ll spend eternity. But you have brothers and sisters not just here, but everywhere in the world. You can experience it traveling. It doesn’t matter where you are, in Australia, in America, in Africa, in Europe, you have your family there, people who will do whatever they can for you. It is yours already today. Just be the poor is spirit and have everything. Sometimes people make wrong conclusions. They reason that if we are to be beggars and totally passive before God, it means being passive also in relations to our neighbors. Quite contrary. Just thing about it. If the Father entrusts you His unlimited resources, and He sends you to serve with them the people in your lives. What do you do? Be passive? No! For you have receive everything from your loving Father to pass it on, to care for others. Now you can, for you don’t have to be a god yourself and tremble about how to control your live. You are free to live for others, for you know that your Father cares for you. It is what the Bible calls true freedom. Look at multitude of wonderful examples, how God has worked through the poor in spirit. Look at apostle Paul and other apostles. Look at our own Dr. Martin Luther. Look at so many ‘poor’ in spirit, whose service has changed our world. Look at people in our congregation, whose service has changed lives of so many. This is how Jesus describes, what it means to be a Christian. 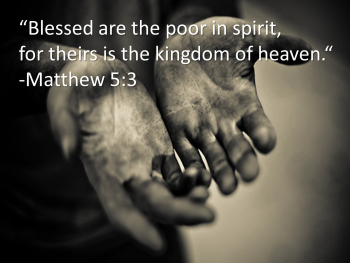 „The poor in spirit.” Let’s confess that we are unworthy servants, ‘the poor in spirit’ and let’s receive His Kingdom.